For the first month of her life, Ree reminded us of Nell -- hated the car seat, hated the swing, hated being laid down for even a moment. Cried -- no, screamed -- pretty much any time she wasn't being held, and could crescendo to choking on her own wails in the 30 seconds it took me to use the bathroom. So, I wore her in my wrap just as I used to do with Nell. Unlike Nell, though, Ree wasn't so into dozing in my arms if she wasn't in the wrap. She seemed to sleep lightly and stir easily and have trouble settling. And transferring certainly wasn't happening -- the first few nights at home from the hospital I would try to transfer her into the co-sleeper, only to have her immediately wake and have to start the back-to-sleep process again. Eventually I gave up, the need for sleep won out, and she slept nestled in the crook of my arms for those early weeks. Then on the day she turned one month old, she took a three hour nap by herself in the afternoon, all swaddled up. It was fantastic. And each day she's continuing to show us in a variety of ways that she is not her big sister, but is her own little person. At first we thought she was Nell's miniature in appearance, but as the days passed we saw more differences. This girl might have brown eyes, not blue! And that dark, straight hair is shorter than Nell's was. Her complexion is a bit more olive-toned, we think. And while Nell was smiling big, dopey grins by one month old, Ree is a bit more reserved. 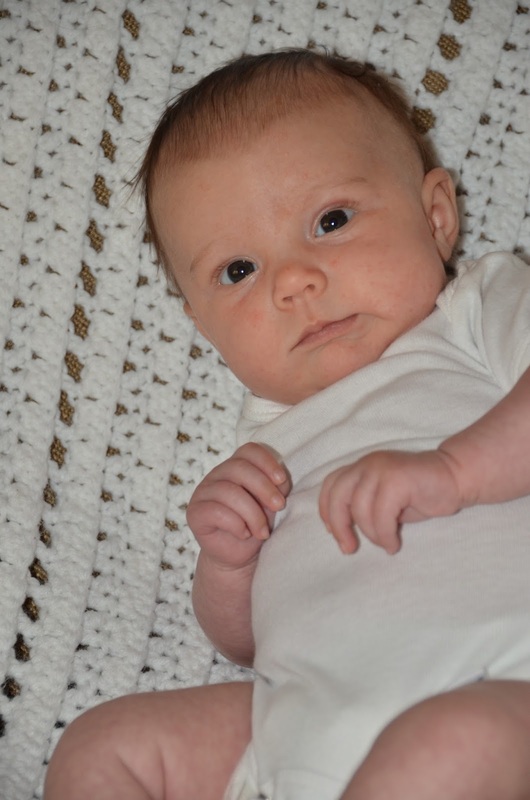 In any case, without further ado... Ree at one month old! Weighed in at 10 lbs, 10 oz. Is rapidly outgrowing her newborn sized clothes. Is spoiling me by being such a good sleeper at night, with three to four hour solid chunks of sleep, and the occasion six hour stretch! Thank you, little lady! Ree, Ree-Ree, Riesling, Baby Ree, or "Baby Wee," as Nell would say. sucking on her thumb / hand / wrist... when she can find it. making noises other than crying... she's testing out a coo here and there. Sweet baby girl, that I get the gift of having a newborn in my arms again is almost too wonderful. Totally worth the hyperemesis and the pregnancy aches and pains and yes, even the labor and delivery. My one and only complaint about all of this is that it all seems to go by even faster the second time around. She is so beautiful. Congrats!